More than 50 million Americans are affected by allergy problems that include food allergies, seasonal and environmental allergies, asthma, and eczema. When a parent is allergic to something, there’s a good chance his or her children will be allergic to the same substance, too. The findings of a small study conducted by researchers at the University of Tennessee Health Science Center in Memphis suggest the benefits of allergy shots a woman takes before or during pregnancy might pass along benefits to her baby, too. When mothers did not receive allergy shots, 62 percent of their children developed allergies. When mothers did undergo immunotherapy, only 52 percent of their children were diagnosed with allergies. There is no cure for allergies but immunotherapy can alleviate the symptoms, sometimes dramatically. 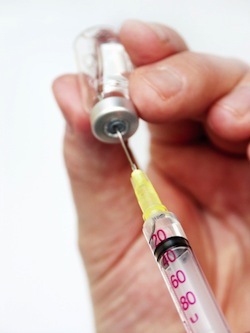 A typical course of immunotherapy involves regular injections for 3-5 years. The injection contains traces of the allergen that stimulate the immune system so that exposure to the allergen causes milder symptoms as time goes by. Women who become pregnant while undergoing immunotherapy are urged to continue treatment without increasing dosage. According to Lieberman, who would like to see further research involving a larger study group covering a longer period of time, says there seems to be no danger to the developing baby from mom’s allergy shots. The findings seem to make sense to Dr. David Bernstein, who teaches medicine and environmental health at Ohio’s University of Cincinnati. He feels “the research raises interesting possibilities” and may help explain “why the instances of allergies have increased so dramatically” in recent years. Source: "Shots During Pregnancy Lower Kids’ Allergy Risk." health24. 11 Nov 2013. Web. Retrieved 20 Nov 2013.